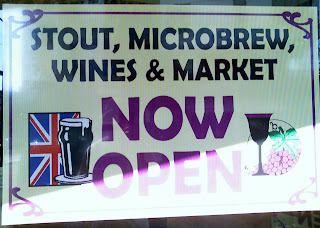 A few weeks ago, when the oddly-named Stout, Microbrew, Wines and Market -- with no real microbrews in stock -- opened near 20th and Hawthorne, I stopped in immediately, hoping for an excellent bottle shop just steps from my house. It was disappointing to find that the beer selection there was not even as good as the 7-11 across the street -- really, not as good as the Safeway six blocks away. Beermongers had just opened a couple of weeks before, so as I was chatting up the SMW&M proprietor, I asked him what he thought of Beermongers. He said, "I don't see how they're going to make it, with New Seasons just down the street from them." I don't see how they're going to make it. I was there just a few weeks ago and I had a similar reaction. The selection was incredibly shallow, the layout exceedingly poor and the general vibe of the store just didn't mesh. It was as though they wanted to be a 7-11, but upscale. For a small store, it really didn't provide me any reason to return there.